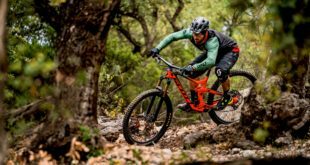 The first round of the UK Gravity Enduro Series saw the theft of a number of Whyte team bikes, among others, from an organiser’s motorhome. Thieves struck in the early hours of Sunday 10th May at Round 1 of the UK Gravity Enduro race at Triscome, Somerset. The race area and campsite were both hit, with theives striking at around 4:00am. They stole a number of high-end bikes, including three of the Whyte Gravity Enduro Team’s G-150 Works race machines. The stolen bikes, belonging to Whyte racers Martyn Brooks, Carl Jennings and Neil Halcrow, are all the latest 2015 G-150 Works models in standard UK spec – SRAM X01 transmission, RockShox Pike RCT3, Monarch Plus Debonair rear shock, SRAM Rail 50 wheelset, Maxxis High Roller II tyres and Easton Haven cockpit. Two sizes; a large and one medium were taken, all in the team’s signature bright burnt orange matt finish. The below photo shows the bikes as they were, complete with race boards, just hours before they were stolen. Avon and Somerset Police are investigating.